The Atlantic sector of the Southern Ocean is characterized by markedly different frontal zones with specific seasonal and sub-seasonal dynamics. Demonstrated here is the effect of iron on the potential maximum productivity rates of the phytoplankton community. 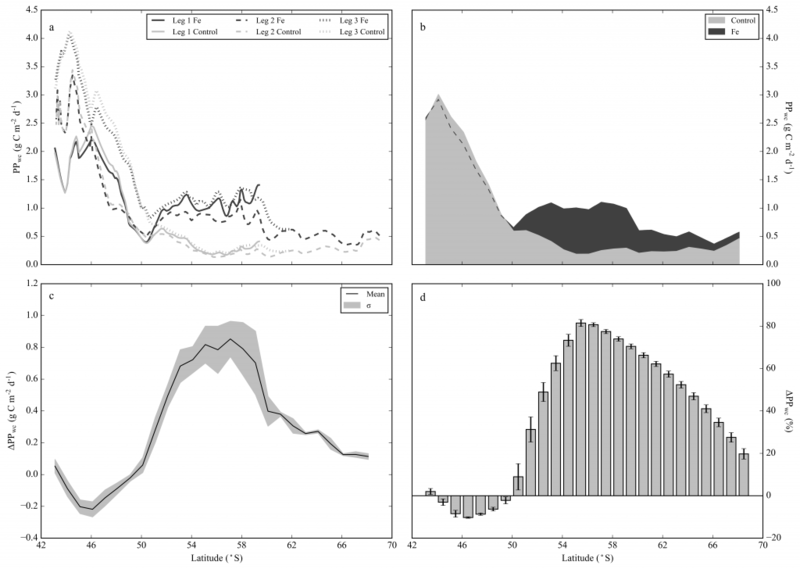 A series of iron addition productivity versus irradiance (PE) experiments utilizing a unique experimental design that allowed for 24h incubations were performed within the austral summer of 2015/16 to determine the photosynthetic parameters αB, PBmax and Ek. Mean values for each photosynthetic parameter under iron-replete conditions were 1.46 ± 0.55 (μg (μg Chl a)−1 h−1 (μM photons m−2 s−1)−1) for αB, 72.55 ± 27.97 (μg (μg Chl a)−1 h−1) for PBmax and 50.84 ± 11.89 (μM photons m−2 s−1) for Ek, whereas mean values under the control conditions were 1.25 ± 0.92 (μg (μg Chl a)−1 h−1 (μM photons m−2 s−1)−1) for αB, 62.44 ± 36.96 (μg (μg Chl a)−1 h−1) for PBmax and 55.81 ± 19.60 (μM photons m−2 s−1) for Ek. There were no clear spatial patterns in either the absolute values or the absolute differences between the treatments at the experimental locations. When these parameters are integrated into a standard depth-integrated primary production model across a latitudinal transect, the effect of iron addition shows higher levels of primary production south of 50°S, with very little difference observed in the subantarctic and polar frontal zone. These results emphasize the need for better parameterization of photosynthetic parameters in biogeochemical models around sensitivities in their response to iron supply. Future biogeochemical models will need to consider the combined and individual effects of iron and light to better resolve the natural background in primary production and predict its response under a changing climate. Depth-integrated primary production for each transect, including the mean for each treatment, the mean absolute differences between and the mean percentage difference between the treatments.